Planning a romantic beach holiday in Playa Blanca Lanzarote? Marconfort Atlantic Garden Bungalows are a great accommodation choice. 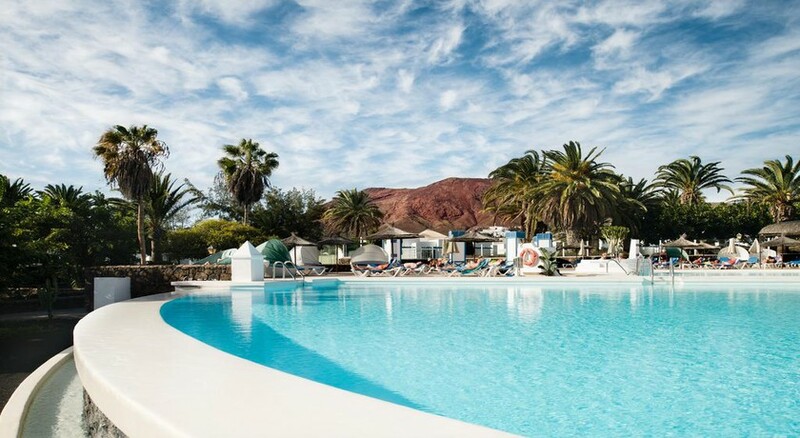 Just a 10-minute walk from the beach, this adults-only resort is a 3-star complex with all-inclusive boarding in Lanzarote, perfect for honeymooners or couples. The stylish, well-appointed bungalows and suites come fully equipped with modern amenities and spectacular views of the Atlantic Ocean. The hotel’s main restaurant dishes up international and local dishes, while the snack bar on terrace serves light bites along with a selection of alcoholic and non-alcoholic drinks. Set amid lush gardens, Marconfort Atlantic Gardens Bungalows boasts a range of leisure and recreational amenities such as an outdoor swimming pool, saunas, gym, volleyball court and mini golf. To add a dash of relaxation on your Playa Blanca holidays, the hotel offers invigorating body treatments that includes wraps, massages and cosmetic services. The Marconfort Atlantic Gardens Bungalows is on the shores of the Atlantic in Playa Blanca, Lanzarote. The complex is built right across the beach, which is just 800 metres from the hotel. The Flamingo Beach is located around 1km and the harbour is about 2km from the hotel. The hotel is also quite close to the town centre and has a variety of restaurants, bars and shops. Places such as Costa Teguise, Puerto del Carmen and Timanfaya National Park are in vicinity, while the Lanzarote Airport is 33.7km from the hotel. Guestrooms offered in Marconfort Atlantic Gardens Bungalows are categorised into Double Bungalow (everything included), Two-Bedroom Bungalow (Private Terrace + Garden Views), Junior Suite and Sea View Double Bungalow. These adults-only accommodations feature separated living rooms and the bedroom comes fitted with air conditioning, an en-suite bathroom, fridge, tea and coffee facilities, a telephone, TV, sofa bed, Wi-Fi, safety deposit box and direct access to the gardens. The bungalows are spacious and beautifully decorated, all designed with a furnished private terrace too. 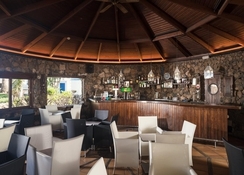 The hotel’s main buffet restaurant serves famous Canarian dishes, classic Spanish cuisine and international food, accompanied with wine and other drinks. The food and drink options in the hotel include Coco Bingo, Snack Bar and a Buffer Restaurant. The Coco Bingo is a place, where you can pick your favourite drink from the cocktail menu. The snack bar serves light bites and snacks along with a wide collection of alcoholic and non-alcoholic drinks. The all-inclusive service offers guests buffet breakfast, lunch and dinner with show cooking thrown in too. Snacks include delicious sweet pastries, juices, cold meats, salads, hamburgers, hot dogs and cold and warm drinks. The bars also serve a choice of soft drinks, tropical cocktails and other alcoholic beverages. 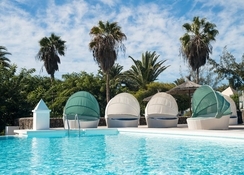 The Marconfort Atlantic Gardens Bungalows Lanzarote features an outdoor swimming pools with solarium, parasol and lounger. The fitness centre is well-equipped with gym facilities, and the wellness centre consists of two saunas and a range of massage services and body treatments. The body care services offered by the hotel has three categories: massages, cosmetic services and wraps. There are recreational facilities such as mini golf, tennis, table tennis, rifle shooting and boccia, stretching, yoga, Pilates and much more – some facilities are chargeable. Other than this, you can take advantage of the Spanish dance lessons provided by the hotel and learn a few steps with your partner. Those who are interested in exploring the area can to the Red Mountain and Pechiguera lighthouse with the help of the hotel’s excursions facility. I cannot find a single fault with any aspect of my stay at Marconfort Atlantic Gardens, whether it be the excellent quality and choice of food, the beautiful surroundings, the charming/helpful staff, the amenities or the location. I can only give a ten out of ten and would encourage anybody to visit which I am certainly going to again next year. Private bungalows. Good location very close to the beach, lovely and peaceful, staff very professional and friendly. Advised that there had been breakins and our neighbour affected while we were there, quick to fix lock may have been due to proximity to road so don’t leave valuables out of safe just in case. However very nice don’t be put off. Adult only accommodation , evening entertainment good however tailored for retirement demographic if you are looking for something more lively. Bar close 11. Good house wine & selection of beverages, wine and drinking glasses , no annoying tip bell or plastic cups. Very good holiday will return. Staff were exceptional, professional and welcoming. Food was delicious with a massive choice and a great all inclusive bar. Pools were a bit cold but probably down to time of year (Easter). Bungalows are cute and well equipped with lovely private terrace areas, currently being refurbished and will benefit from a lick of paint. Only real failing was the 'gym' - one wobbly cross trainer and a few weights does not constitute a gym! Geniunely, a fantastic holiday and we will definitely be going again! A very pleasant week away and good value for money. Only slight criticism was that the entertainment in the evening was pretty everage - think they were thinking all the guests were over 75!